Schema markup is a powerful markup (aka semantic vocabulary) that helps search engines deliver more informative results to users. Embedded in your website, it’s invisible to users. But to search engines, these snippets are like gold. They tell search engines not just what your content says, but what it means. In the early days of search engines, websites were merely crawled to find exact keyword matches. However, blind keyword matching didn’t always deliver valuable results to users. In some instances, website developers had simply stuffed their pages full of keywords. In others, a search engine was incapable of discerning between “Madonna” the singer-songwriter and “Madonna” the statue of the Virgin Mary. Today, search engines are much more sophisticated. There are now more than 100 ranking factors above and beyond simple keyword matching. Each was designed to improve user experience and deliver meaningful results. As a user, take into consideration these two examples. In Example A, the user is merely given a list of websites with small meta descriptions. Alternatively, in Example B, the user is given a similar list of websites with small meta descriptions AND relevant details specific to their search, such as upcoming events, reviews, and contact information. 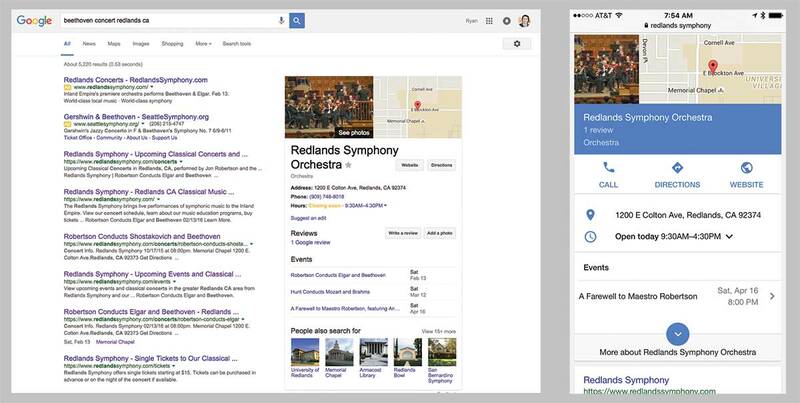 In this case, Redlands Symphony not only delivers a better user experience for their target audience, but receives a lot more search result real estate. can indicate to search engines the term is important. But, the tags don’t deliver a lot of contextual information. Selling tickets to the performance of a Madonna cover band is substantially different than selling a statue of the Madonna. The idea behind Search Engine Optimization (SEO) is simple – make it as easy as possible for search engines to identify your website as relevant. Currently, there is no conclusive evidence that schema improves rankings. However, there are some significant indications that search results with rich snippets have better click-through rates. We can see visually websites with schema earn more search result real estate. And, we know that as of 2014, Schema was used to display additional information in more than 35 percent of results. Despite the clear benefits, just 20 percent of websites are leveraging this tool. This means, 80 percent of website users aren’t capitalizing on their potential Google real estate – giving you a huge leg up if you do. If you want to add schema markup to your website, Google offers a handy tool you can use to verify the schema was added correctly. 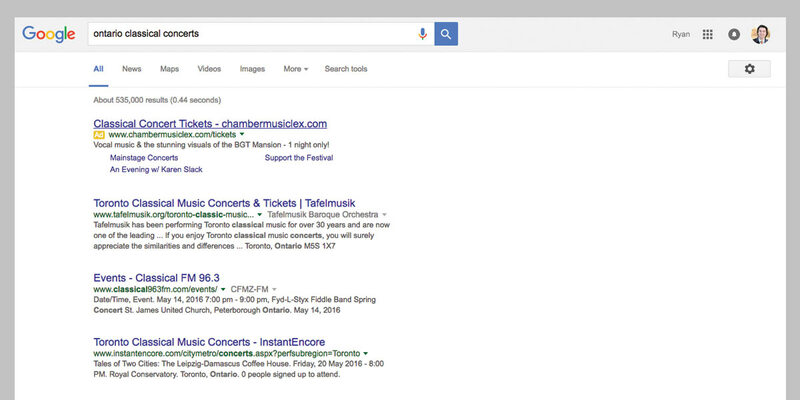 You can paste in your page’s HTML or let google fetch it from a live URL. It will then parse the HTML and let you know if there are errors and what kind of schema was parsed. Checkout the testing tool here. If you want to take a deep dive into what types of schema are available and how to add them to your website, you can browse the Schema.org website. This site was the result of Google, Bing, and Yahoo’s collaboration. It’s an excellent resource that we utilize regularly. Not sure where to start, but are you interested in giving your website better context? Let’s chat about how to incorporate schema on your site. Need help to make an impact? Join our always relevant newsletter. Its chock-full of tips and tricks to grow your business. Copyright © 2003-2019 RWL Design, Ltd.